“Palestinian” suspension. Applied by suspending the victim with the wrists or forearms bound together behind the back and tied to a horizontal bar or rope. “Parrot perch” suspension. Applied by suspending a victim by the flexed knees from a bar passed below the popliteal region, usually while the wrists are tied to the ankles. Suspension with the arms in for­ward flexion. "Crucifixion” suspension with the shoulder joint in abduction. “Palestinian” suspension may produce permanent brachial plexus injury in a short period. There is such an unnatural strain on all the muscles and ligaments of the shoulder girdle that one or both shoulders may dislocate. Victims complain for several days afterwards of inability to raise the arms above the head and sometimes of numbness and weakness of the fingers. For years afterwards they may experience pain on raising the arms, lifting weights or combing the hair. On examination there is usually tenderness in the muscles around the shoulders and scapulae and severe pain on passive movements, especially extension and internal rotation of the shoulders. There is occasionally winging of the scapulae (prominent vertebral border of the scapula) caused by traction on the long thoracic nerve, easily missed unless specially looked for by asking the subject to press against a wall with outstretched arms, and there may be permanent deficit of the lower roots of the brachial plexus, as shown by sensory deficit in an ulnar distribution. The “parrot perch” (pau de arara, the chicken, the bar) is another form of suspension which causes immediate severe pain. It has been commonly used in many Latin American countries but is also seen in Africa. The wrists are bound together in front of the body, the arms passed over the knees and a pole thrust behind the knees. The result may be rupture of the cruciate ligaments of the knees or sensory or vascular damage below the knees. Victims will often be beaten while suspended or otherwise abused. In the chronic phase, it is usual for pain and tenderness around the shoulder joints to persist, as the lifting of weight and rotation, especially internal, will cause severe pain many years later. 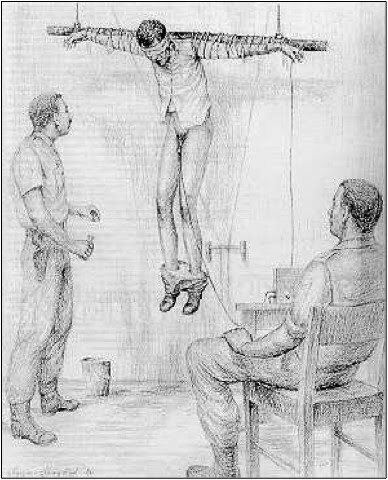 There are many other methods of suspension including hanging by the ankles or with the arms tied to a cross-bar as in ‘crucifixion’. Whether there will be any immediate or later ill-effects depends on the method used, the posture of restraint and the distribution of bonds, which may have been not only at the wrists and ankles but at any point of the arms, legs or trunk. Suspension by the hair can avulse the scalp leading to an immediate cephal­haematoma which may persist and be palpable for months or even years as a boggy swelling. In any event, the scalp is likely to remain tender, sometimes with the scalp attached unnaturally firmly to the underlying skull. In general, complications in the acute period following suspension include weakness of the arms or hands, pain and parasthesias, numbness, insensitivity to touch, superficial pain and tendon reflex loss. Intense deep pain may mask muscle weakness. In the chronic phase, weakness may continue and progress to muscle wasting. Numbness and, more frequently, parasthesia are present. Raising the arms or lifting weight may cause pain, numbness or weakness. In addition to neurologic injury, there may be tears of the ligaments of the shoulder joints, dislocation of the scapula and muscle injury in the shoulder region. Various forms of suspension can result in neurologic injury which is usually asymmetrical in the arms. Brachial plexus injury manifests itself in motor, sensory and reflex dysfunction. Reflex examination. Reflex loss, a decrease in reflexes or a difference between the two extremities may be present. 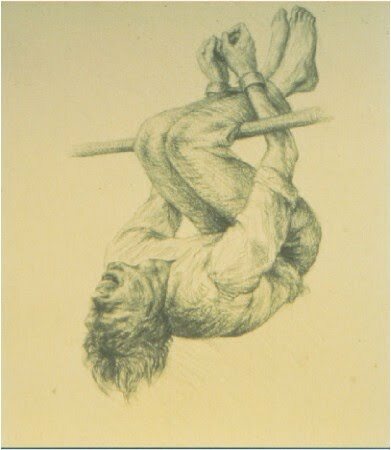 In “Palestinian” suspension, even though both brachial plexi are subjected to trauma, asymmetric plexopathy may develop due to the manner in which the torture victim has been suspended, depending on which arm is placed in a superior position or the method of binding. Although research suggests that brachial plexopathies are usually unilateral, that is at variance with experience in the context of torture, where bilateral injury is common. Damage to the upper plexus. Shoulder muscles are especially affected. Abduction of the shoulder, axial rotation and forearm pronation-supination may be deficient. Sensory deficiency is noted in the deltoid region and may extend to the arm and outer parts of the forearm. Assessing physical evidence following suspension may be complicated by the fact that suspension is often accompanied by beating, so it is impossible to generalise, but if the examiner asks the subject to describe or mime the particular posture and stress he was subjected to, it is possible to decide what areas of skin, joints and muscle groups to concentrate on during physical examination. 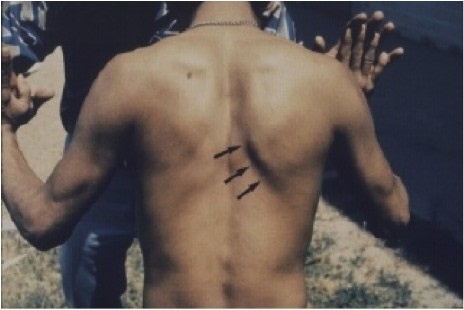 This entails a detailed search of the skin for marks of bonds, the joints for limitation of movement by pain or, occasionally, tendency to subluxation, and muscle groups for abnormal tension and tenderness as well as a neurological examination for peripheral nerve lesions and the extremities for vascular changes. Abnormalities are likely to be easily found in the immediate aftermath but usually fade with time. Unless the full thickness of skin has been destroyed by tight bonds there is unlikely to be any permanent scarring where bonds have been applied though they must be searched for. Their absence does not negate the allegation. In most cases all signs on the skin fade after a few days, but if abrasions are deep or become infected, there may be permanent scarring, changes in pigmentation or occasionally, only depilation (hair loss). Lesions are usually linear and transverse and most marked over bony prominences. These are suggestive, but only if they are almost completely circumferential round the limbs are they are virtually diagnostic of restraint. Though usually situated at the level of the wrists or ankles, they may be found further up the limbs because bonds may be applied higher or ride higher up. In many cases joint movements remain limited and painful for months or years and tenderness of muscle groups is often persistent. Motor or sensory changes tend to improve with time. The sooner after injury that treatment can be instituted the better, but it is rare for any professional care to be possible until long after the events. Victims often say that they were treated by traditional methods of massage and exercise, with relief of pain on their release from detention. Late treatment concentrates on physiotherapy with massage, graduated exercises and postural re-education. At first, the therapist must be extremely careful to respect the patient’s fear of contact and may not even be able to touch him until a satisfactory rapport has been established.